Captain Will is the founder and owner of Peconic Cruise Line. A native Greenport, his childhood unfolded in, on or near the water on Long Island’s North Fork – exploring shipyards, swimming, boating and fishing. He also spent countless hours at Port of Egypt, the fishing station on Southold Bay his family opened in 1946 that evolved into a full-service marina and Grady-White dealership. The saltwater in Captain Will’s veins has kept him connected to the sea. Currently the General Manager at Port of Egypt Marine, he has also worked as a marina dockhand, boat towing captain, salvage diver, marina manager, boat handling skills instructor and commercial tuna fisherman on a longliner. To say that Captain Mike is a lifelong mariner would be an understatement. He learned to walk on the deck of his father's boat and grew up spending every moment he wasn't in school on the water. 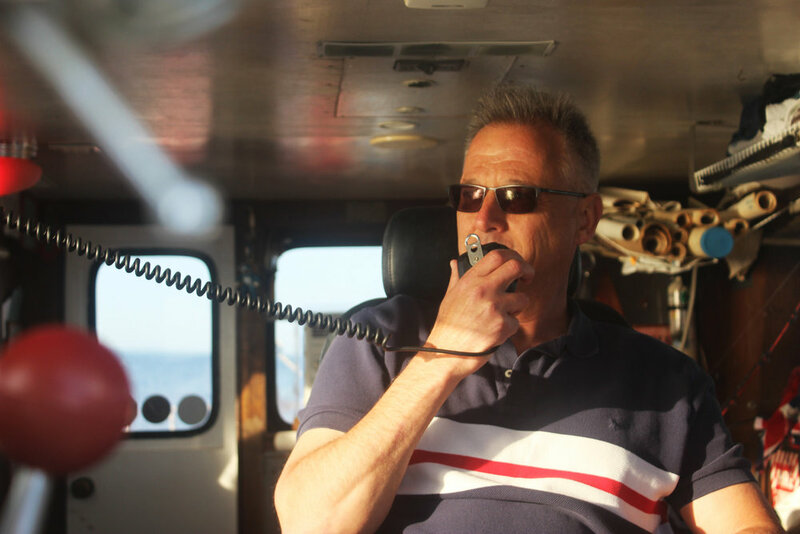 Captain Mike loved the freedom of being on the ocean so much that he decided to follow in his father's footsteps and make his living from the sea. In the years that followed, he's passed more lighthouses than telephone poles and couldn't imagine being anywhere else. Captain Will and Captain Mike each hold a Master Near Coastal Captain's License - Certified for 100 GT (gross tons). They look forward to welcoming you aboard and sharing their love of the sea with you! The Peconic Star II has had a long and colorful history over the last seven decades. Built as an Air-Sea- Rescue Boat by the U.S. Army to save downed pilots, her hull designation was P-444. At 85’, she was in the midrange for size in her class. Two 2500-horsepower gas engines powered her to a top speed of 35 knots. She had two 50-caliber guns mounted port and starboard on her top deck, and she boasted a 20-mm anti-aircraft gun on her stern. Each boat was assigned a crew of 14 to 16 including a surgeon to attend to injured pilots they saved. After the war, P-444 was sold at auction and started her life in the private sector. Her first “name” was Ukulele Lady, although information on her use during that period has been lost to time. Her next owner was Captain George Sinn who sailed her in Wildwood Crest, NJ, as Big Flamingo and later as the sightseeing vessel PT-109. The hull design for crash boats and PT boats was very similar, so she was made up to take advantage of the famous boat on which John Kennedy served, the PT-109. Sold to Captain Jeff Stewart, she was renamed Buccaneer and used as a charter fishing boat. Captain Dave Brennan purchased her, and she was renamed once again. The Peconic Star II has been sailing out of Greenport ever since, operating as an open boat fishing for porgy, fluke, flounder, striped bass, blackfish and sea bass. Over the decades, she has served generations of fishermen and seen many fish reeled up over her side. The Peconic Star II will continue her illustrious career as an excursion boat plying the waters of Long Island’s East End. We invite you to experience a cruise on this historic vessel and enjoy spectacular views, the wonder of spending time on the water and the hometown hospitality of Peconic Cruise Line.